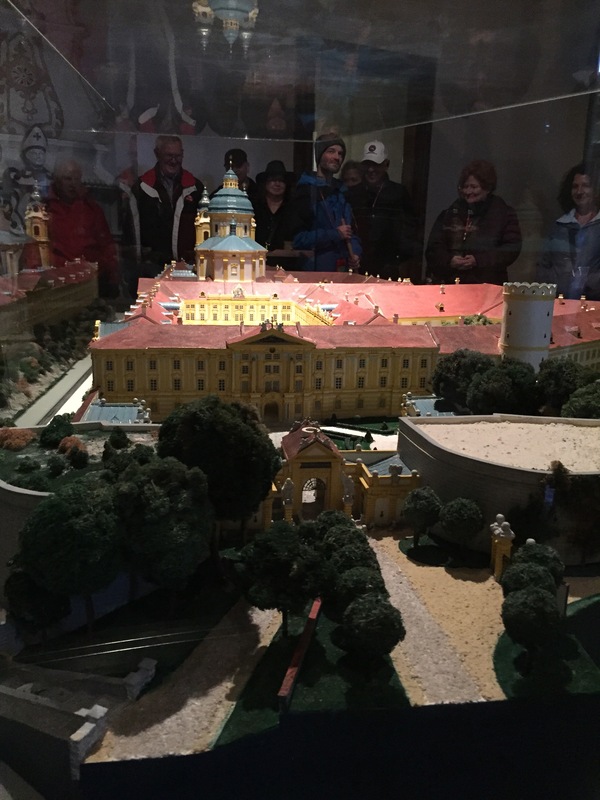 Melk Abbey was built between 1702 and 1736 by Jakob Prandtauer, and is possibly the most famous Abbey in Austria. It was originally a royal palace, and in the 11th century, Leopold II presented the palace to the Benedictine monks. This monastery is more than 900 years old, and is also still run as a monastery school with over 700 students. Since we were delayed in Passau, we arrived late, almost 3:00 pm. The ride from the port to the Abbey was a short 5 minute drive, but the view of the city was breathtaking. Our group congregated in the courtyard before heading inside. Our guide said his name was Phillip, but if we didn’t like him, his name is Thomas. Phillip moved quickly from room to room, but the pictures should be easy to decipher on what we saw. An interpretation of heaven on earth in Room No. 6 showcases a portrait of St. Benedict encircled by angels. One room we went in had a scaled model of the Abbey, and then we went outside to connect to the library, but once inside the library, we were forbidden to take photos in there. From the library, we went down a spiral case and connected into the church. Like most European churches, this church was impressive with dark wood and lots of gold, and fresco ceilings. We didn’t have much time to admire the church, as we had to get back on the bus. Like in many touristy places, the exit from the church was into the gift shop.